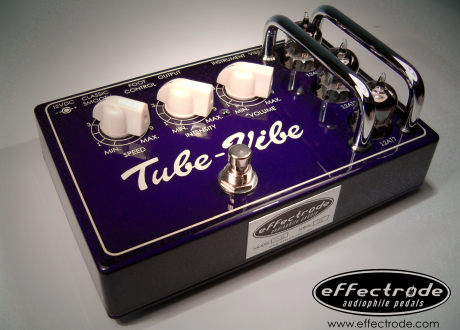 The Tube-Vibe is a no compromise, innovative & original re-design of the classic Uni-Vibe. The pre-amp, mixer and phase-shifters sections are built on triode tubes operating at real amp plate voltages and it has a powerful L.F.O. that makes it possible to sculpt thick, swampy vibe tones at higher modulation rates through to textural & spacious chorus effects at slower rates. The tone is outrageously cool – its absolutely the lushest, most psychedelic sounding guitar pedal there is! One of those devices that epitomise analog with its unique, slightly blurry, liquid phase-chorused tone, impossible to simulate. All Tube: Circuitry for the ultimate in audiophile performance – low backgound noise and stacks of headroom for a rich and musical Vibe tone. The fundamental tone and drive of the Tube-Vibe can be further tweaked by swapping the 12AU7 tube with other 9-pin varieties, such as 12AY7, 12AX7, etc to boost and push your favourite vintage/boutique tube amp into overdrive for some seriously thick/sustaining tones. True Bypass Switching: With Effectrode’s unique ‘anti-pop’ or thump footswitching circuitry utilising sealed, gold-contact relay to eliminate the possibility of dirty contacts degrading the sound and minimial internal audio path. LED: Pulsates with modulation speed for visual song tempo matching.